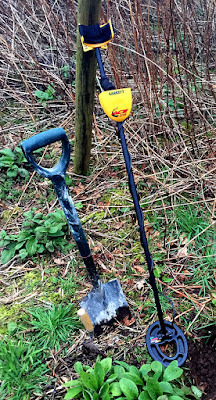 Back when I was a kid and still in 'explorer' mode, I persuaded my parents to buy me a metal detector so I could make them rich and they could buy me a bike. I have no idea what kind it was but it was cheap, it was blue, it made noises and it gave me an excuse to get muddy, so naturally it was brilliant. My only memory of using it, other than a vague recollection of trawling the beach for pennies, is when my folks - totally illegally - took me and it to Glencoe in the Scottish Highlands to look for Irn Bru cans dropped during the massacre in 1692. After 10 drizzle-soaked minutes I found a rusty old beer barrel hoop at the bottom of a tree, then got bored, went home and gave the metal detector away. The hoop stayed where it was and we weren't gaoled. Now, a mere 30-some years later and with a small patch of historic land I can legitimately call my own, I'm back. And I'm packing a Garrett Ace 250, which is apparently perfect for a newbie like me. 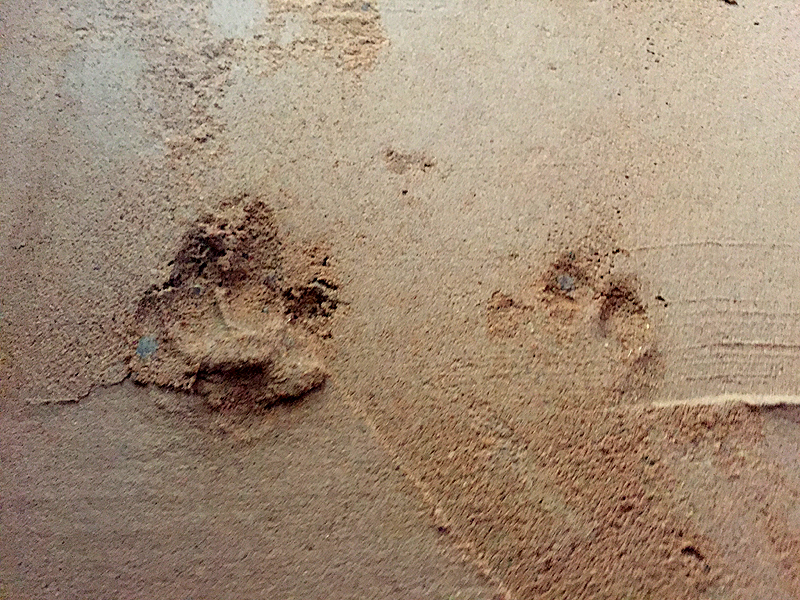 Moving here has given us an appreciation for the history of the property, so the promise of literally unearthing a piece of it is too good to resist. 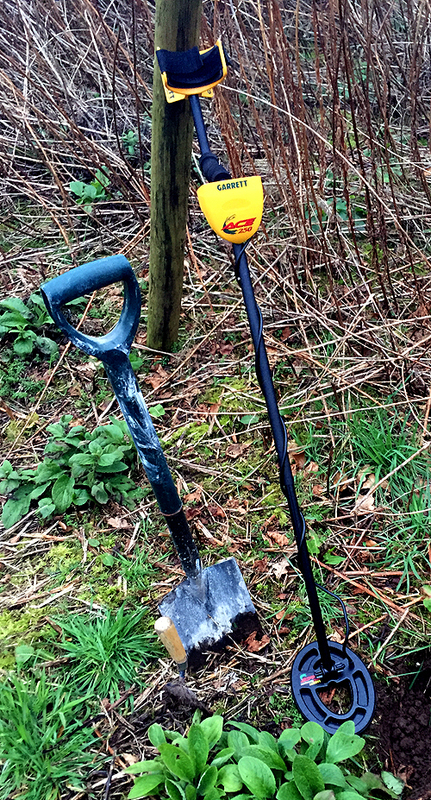 The metal detector might be £175 but it'll be completely worth it if I find just one Victorian or Georgian coin. My first spin around the place ended with the Ace 250 going bananas for no apparent reason and refusing to power-up, so it went back and was replaced a few days ago. This time the new one is behaving better, but I've read that getting to know how it responds to different triggers is a steep learning curve - and that's proving to be true. Often it beeps once but won't repeat it, many times I get a beep which seems to move around like I'm chasing a robot mouse and on other occasions it'll insist there's a horde of treasure beneath my feet only to petulantly stop beeping altogether when I've dug a crater big enough to bury an elephant. Nevertheless I have been finding stuff: a 5ft length of bent iron bar; a lump of lead with a bolt in it; a nail; acres of chicken wire and three small calibre bullet casings. I've also found what may or may not be an original hinge from the original gate at the front, but because that was lying on the surface under a tree it doesn't really count. 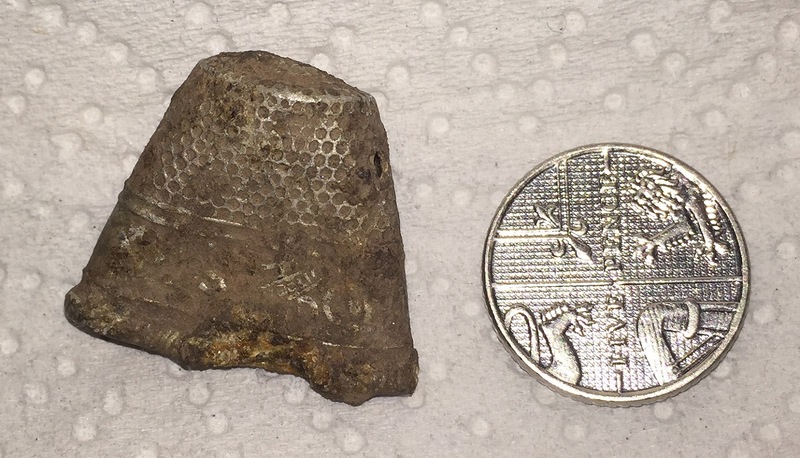 But yesterday I found my first proper Thing, and we're well chuffed! Dawn was Googling all night about it. 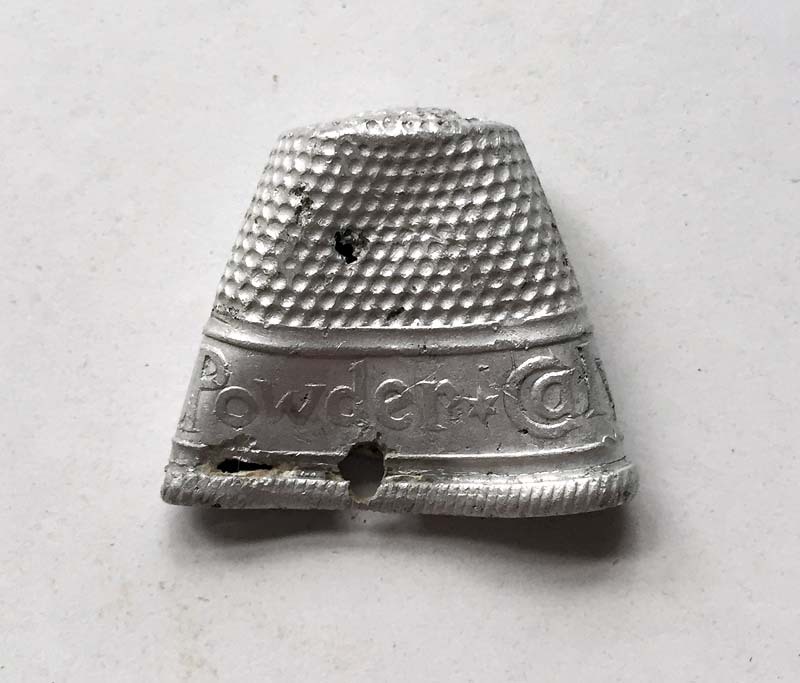 It's a mostly-flattened Calvert's Carbolic Tooth Powder thimble, and at first I thought it was probably silver (I wanted it to be silver, too) although it has since been suggested that it could be aluminium, which sounds more likely because it was clearly a promotional freebie. 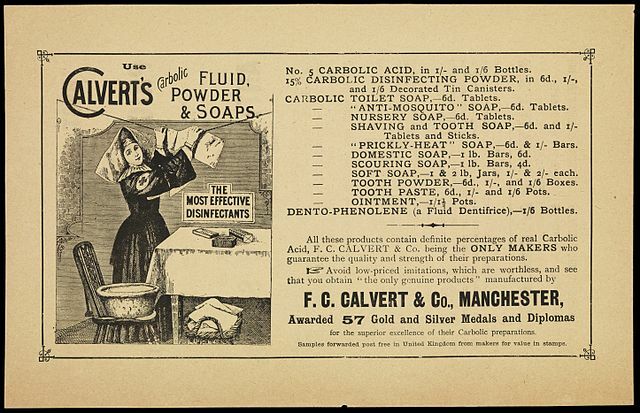 If that's the case I reckon it's possibly dated somewhere between the last few years of the 1890s and the first few years of the 1900s because it seems that aluminium production in Britain sky-rocketed around the cusp of the new century (with prices dropping accordingly), and the latest Calvert's advertising I can find that uses the logo enclosing the 'a' inside the 'C' is around 1908. Also, see the little star on the picture below? It's only used to mark the beginning and end of the legend, but over a century later it looks very much like a Star of David to me. Back then, presumably, once the symbol could be mistaken for signifying Judaism I doubt it would have been used in such a flippant manner - which again puts it somewhere in the first decade of the 20th Century at the latest. Ish. It's all over-reaching guesswork, of course, but in lieu of anything concrete I'm happy to go with that for now. Sadly that's the limit of my Calvert's thimble knowledge (should've paid attention in school) and the internet has failed in its duties to provide information about such a thing. 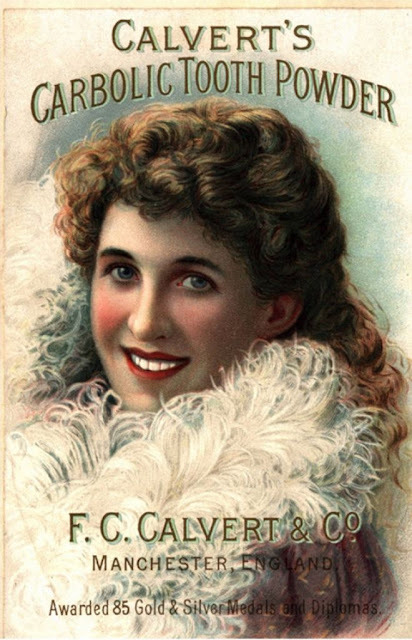 Calvert's, yes - to a point, but Calvert's thimbles, no. So we're not rich yet, and I still can't get that bike, but I'll keep looking. I won't be happy until I find my first coin. I'll let you know when it happens. We just happened to have a jar of silver cleaner in the cupboard. This is the result after a lot of soaking. The other side. 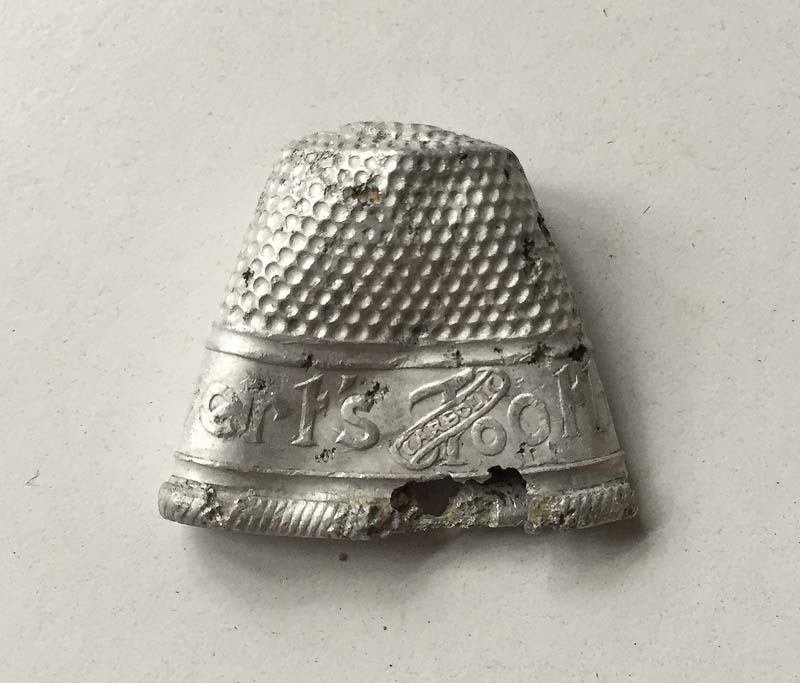 Not a second thimble, dad. Do storms in the UK feel worse now that we've decided they need names? They do, don't they? Is it just me? It has been a few days since I last updated the blog so I thought I'd do a quick no-particular-order-round-up of what has been going on. Simply-put, quite a lot of things have been happening although nothing worthy of a post on its own yet. So here's a wee summary while I wait for Dawn to get her hair cut and return bearing both a bonny new barnet and pizza. It's warm here in the shed with the electric blanket and SausageTheCat curled up at my side. It's bloody Baltic out there. A workhorse, that is. Although it's more like a wallowing hippo. 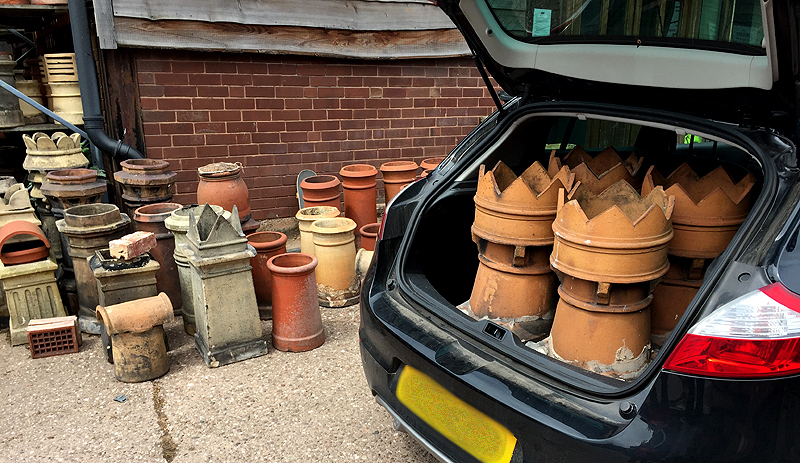 boot of a Renault Megane. The shame of it. Back in the excited planning stages before we bought The Lodge we pondered the merits of getting our hands on a cheap van to haul dirty stuff around during the renovation - bags of lime, pallets, timber, bricks etc. We never quite got to the completion stage of that idea though, and instead settled for pretending our regular 'town' cars - my Renault Megane and Dawn's Ford Focus - were Transits, getting them grubbier and grubbier. We got to the point where a boot full of sawdust and mud was a good thing because the mess hid the rips and scratches. With the benefit of hindsight that really wasn't very good at all. So having thought about it for a few weeks we finally took the plunge and bought a 2.5l Mitsubishi L200 4x4 pickup with a tow bar and roof rails. A truck. We've bought a baccy-chewin', ale-swillin', arse-slappin', mother-cussin' ManTruck. It's a few years old, a bit lived-in inside, has windey-windows, 116,000 miles on the clock and has been used for its intended purpose, but these things are (hopefully) bombproof and with a good valet and engine steam it should do us for a year or two. The bonus is that because the Megane is getting the elbow to make way for it, we should get a little money back to put in to the house. The downside to that, of course, is that this thing is huge and I'm a bit scared of it. It's the size of a bus and I can't see out of the back window so I'm going to have to investigate getting parking sensors fitted just to underline the whole 'hairdresser' thing. Also, you know in old movies when someone's steering a car by turning the wheel a few inches left then right over and over, but the background shows a perfectly straight road? It drives like that. 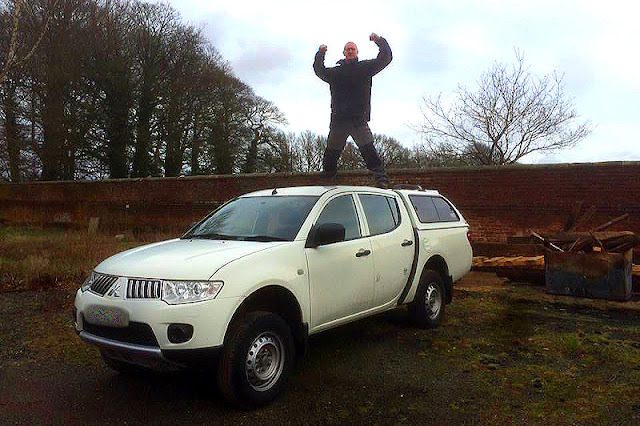 Too grrr to give it a name, The Truck is currently being used to store a couple of m2 of dry (bought) wood because we've got nowhere else to put it without it getting wet. It's a mobile woodshed. And I've already pancaked a meandering pheasant with it. I'm not sure who was more traumatised. But anyway, as an impressed neighbour said the other day: "Well done - you're Country now." Just wait until I get it stuck in the woods on a joyride and I have to trek to their farm begging to be winched out with a tractor. That'll show them just how Country I am. We are fighting them on the beaches, we are fighting them on the landing grounds, we are fighting them in the fields and in particular we are poisoning them at the side of the shed rather than above the kitchen ceiling, where the expected bloodfest failed to materialise. As a very quick recap, I mentioned a while back that we had rats in the kitchen ceiling and we were setting traps baited first with lemon curd, then lemon curd and raisins, then finally peanut butter in an electronic rat trap. Yet we only caught one rat back in the early days of the problem - and that was with a mechanical snap trap. We heard them a few more times after that but failed to bag any more, and eventually I killed the plastic electronic trap when it dropped out of the hatch and shattered everywhere on the tiled floor. We haven't heard them since Christmas Eve and we still haven't found where they're coming in... although we haven't looked very hard, to be fair. but your fate is sealed. Sorry and that. Meanwhile a couple of weeks ago, when Dawn and I were lying in bed one night watching yet another US TV series on the laptop (we've just finished Transparent - it wasn't great), we heard something nibbling away at the aviary mesh around the bottom of the shed between the railway sleeper footings, which is there to stop anything setting up home under the floor. It spent a good 20 seconds sharpening its teeth and only paused briefly when we banged on the wall. Next morning we decided to take no prisoners and out came the big guns in the form of a 5kg tub of bright pink poisoned grain and two horizontal drainpipe-type bait stations with clear vertical feeder pipes offering tasty death from above. One went in the front garden on the far side of the shed near the back corner (mere feet away from Dawn's side of the bed), and the other went at the very end of the back garden area on the other side of the house as far away from the building as possible to minimise anything crawling back to the kitchen ceiling and going toes-up. Although not many, we're still getting flies in Bedroom 1 after something died in the chimney four months ago and we want to reduce the risk of it happening again, naturally. 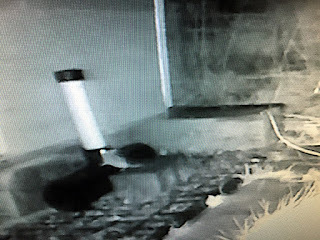 Now I know I can be a bit odd from time to time, so it should come as no surprise to learn that I decided to set up a spare CCTV camera to watch over the shed poison to see how popular it was. And crikey, was it popular. It was like a food bomb had gone off. We forgot to watch it the first night, but by the second there were frantic comings and goings all night with rodents (Mice? Rats? Voles? Shrews? All of the above? It's difficult to get scale from the CCTV) scurrying back and forth like mad, then sometimes just sitting in the pipe filling their faces for five minutes or more. It was genuinely fascinating and has given me a whole different view of the beautiful countryside - it's riddled with rats and stuff. Riddled. Anyway, I had to refill the shed bait station after just a week, but activity understandably started slowing down a little after that. The back garden station isn't quite so popular but it has had a half-refill and I keep finding pink areas on the ground nearby where a feast has taken place and only the husks are left. 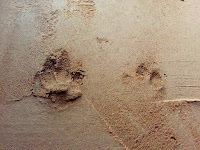 So hopefully the kitchen invaders are among the greedy masses somewhere, God rest their furry little souls. 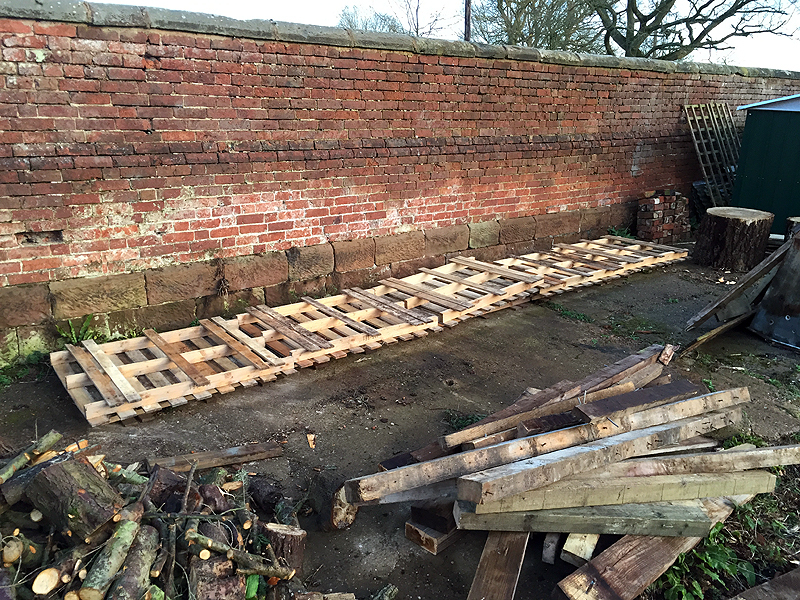 I wrote about our wood woes a couple of weeks ago here, and in an effort to plan ahead for next year I started work on a woodshed made from reclaimed timber, pallets and box profile steel sheets (essentially corrugated iron, but a bit less 'chicken sheddy'). It was carnage. New Orleans all over again. 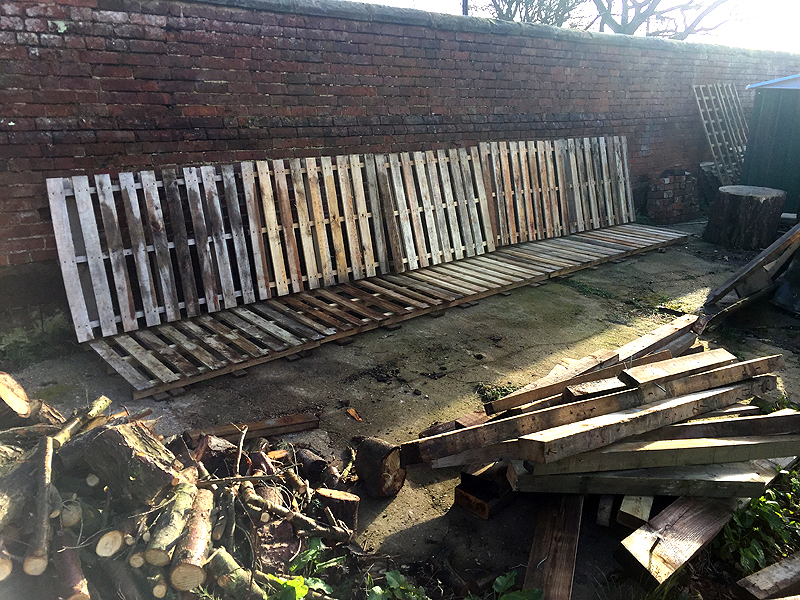 When it was safe to venture outside without risk of being decapitated by an airborne cow I had to stand all the pallets back up again, which literally took minutes. After that I decided to actually screw some of them together, chop some bits off and kind of loosely connect sections with lengths of timber, screws and blind faith, but I've only got a corner done so far and even then I'm not sure how to plan the roof in such a way that it doesn't end up in the village next time the breeze picks up. I've taken some pics of the progress and would eventually like to write a post explaining how to make such a beast, but as I'm totally winging-it already I'm not sure how useful it would be. I'll see how it all pans out when/if it gets finished. £90 for a bag of old junk? With progress in the Living Room hitting a near-glacial pace (until this week*) we idly turned our attention to decor. Specifically arty farty stuff. The fireplace and exposed chimney breast is lovely and all, but what do we want above the mantelpiece? We'd both like an original piece of art of some description but both of us are a little vague about the details, so we decided to keep our eyes open and our thinking caps on. Meanwhile I discovered an online auction site that isn't the one you think, full of fascinating stuff up for grabs - everything from Bulgarian farms to defribrillators to actual tanks and Royal Air Force 'practice bombs' - among which I found a lot offering 32 antique pocket watches in various states of disrepair, although there were no other details - just general photos of the collection which was nestling in the bottom of a Sainsbury's carrier bag. "Aha!" thought I. "They're likely to be Victorian or thereabouts and we could do something pretentious with them!" So we bought them. And they're absolutely lovely. 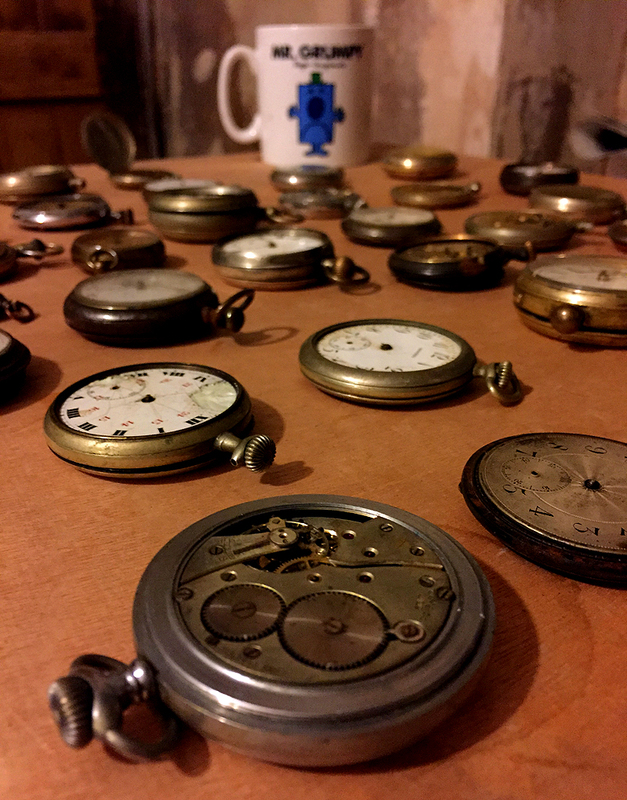 All but two or three have a beautiful patina of age, appearing very old indeed in Watch Years, and all of them are missing bits and pieces somewhere: glass fronts; metal backs; hands; cogs (gears? ); springs; numbers; most of the above etc, and although some are pretty similar there are loads of different designs and sizes. Some even have small hand-engraved inscriptions inside: BA, EH and Queens 1974 (not an antique, I know, but it still has history). All the auction place could tell me when I asked was that they came from a house clearance, so not much to go on. The plan is to display them somewhere - maybe or maybe not above the Living Room fire, and although we have a vague idea of how we might do that we're still on the idle hunt for alternative ways in case we're missing something obvious, which is entirely possible. We're in no rush though, so shrouded in a 5p bag of bright orange modern-day corporate greed they shall stay until we're ready for them. The lime plasterer is here! Andy S, our very own Restoration Man, has spent the last four or five days prepping and plastering the Living Room and fending off stupid questions from yours truly. Conversations have included serious highbrow issues such as the legal and moral obligations of the Federation Against Copyright Theft (FACT) and the considerations and problems faced when referring to an Ulaanbaatarian in polite conversation. Slightly lower-brow, yet arguably more important, topics have included: 'Other than our respective partners, Mila Kunis is the most beautiful woman on earth - discuss', the importance of waterproof pyjama bottoms, 'Steve Wright in the afternoon - eaten alive by tortoises or trampled to death by dachshunds?' and gimp suits. Meanwhile I have been lifting, carrying, collecting supplies, generally skivvying and regularly spraying the plaster down with water so it doesn't dry out too quickly... and the room has been utterly transformed. I can't stop putting the light on to look when I pass. I'll save the details for a post of their own when it's all finished, but it's safe to say that we're delighted with the progress so far and there's still a week or two - and another room - to go. 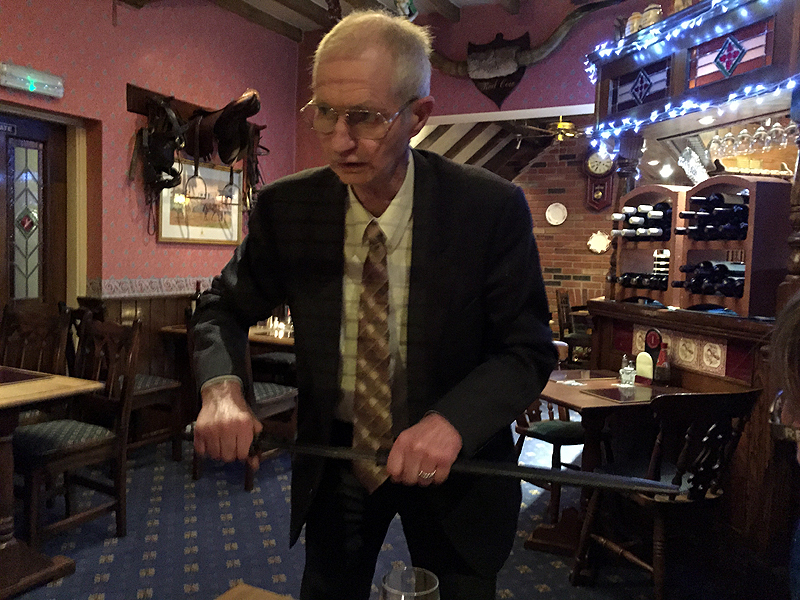 Randomly, here's a photo of Terminator Trevor, pictured yesterday during a quiet meal in a country pub, demonstrating how he motivates me when I'm flagging. Never off duty, that man.